I have an ILNP polish to share with you today that has been on my wishlist for a long time. I finally got around to getting it in a gift exchange last fall. Who doesn't love rose gold? I sure love it but it can be a bit of tricky color for me. If it's too warm it doesn't really do wonders for my skin tone, but finding the right rose gold can be difficult. Rose and gold are warmer tones, so I'm already at a disadvantage. How will Juliette fair for me? 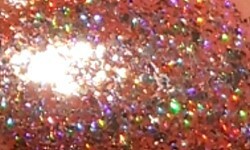 Juliette is a holographic rose gold with metallic flakes. Color: I think this rose gold works for me alright. It maybe a touch too warm, but overall I do really like it. I love metallic flake polishes so this is what I was drawn to instantly when I was oogling over this color over a year ago. I don't know if this finish really works out for me, though. It's all glitter particles without a color base. It doesn't look really smooth or cohesive on my nails because of this and I wish it had some sort of base going on. Formula: This formula on this was OK. I think because it is all glittery particles it makes it harder to apply cleanly and smoothly. I used 3 coats above. It's not completely opaque, but close enough. Overall: I'm a bit disappointed with this polish. I think I had such high expectations for it and I had been wanting it for close to a year. I do love the color. I like the finish too, but the finish didn't work out too well application or look wise. I really wish there was some sort of colored base or even a shimmer base in this to give it a cleaner more complete look on the nail. It's not a bad polish and I really think these issues I have with it are more about my personal preference than what most people would feel about it.